The Morakniv Bush craft Pathfinder is one of the sturdiest and largest outdoor knives Mora has ever offered. The razor sharp, burly 1/8-inch (3.2 mm) high carbon steel blade is treated with a protective tungsten DLC anti-corrosive coating that also provides a distinctive black look. 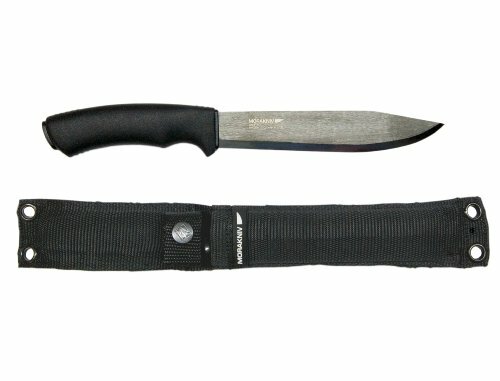 The 6.75-inch blade is the longest in the Morakniv Bush craft family and is particularly well-suited for survival applications such as batoning. The 90-degree spine of the blade has also been specially ground for use with a fire starter and for making tinder shavings. Mora knives made from high carbon steel achieve high hardness, sharpen easily and are exceptionally tough. High carbon steels are preferred in applications that demand durability and frequent regrinding. The material is harder than stainless steel, allowing it to hold a sharper and more durable acute edge. Mora Knives are made from high-quality carbon steel, which is characterized by ultra-fine carbides that result in superb forging and hardening properties. A double-molded rubber handle is ergonomically-designed to be comfortable and durable while offering finger protection and ant-slip performance. The Bush craft Pathfinder includes a heavy-duty Nylon MOLLE-compatible sheath reinforced with plastic and secured with a snap closure. Blade length: 6.75" (171 mm); Blade thickness: 0.125" (3.2 mm); Total length: 11.6" (295mm); Weight: 8.8 oz. (249g). Made in Sweden.